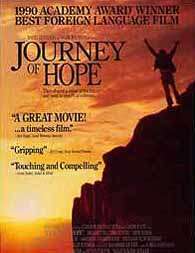 Journey of Hope (German: Reise der Hoffnung; Turkish: Umuda yolculuk) is a 1990 film directed by Xavier Koller. It tells the story of a Turkish Alevi family trying to illegally emigrate to Switzerland, a country they know only from a postcard. The film is a co-production between companies in Switzerland, Turkey and the United Kingdom. The film won the 1990 Academy Award for Best Foreign Language Film. The film was submitted to the Academy of Motion Picture Arts and Sciences (Los Angeles, USA) by the Swiss Government, resulting in the second Oscar win ever for Switzerland. In a village in eastern Turkey, tales of the economic success of Turks in Switzerland inspire Haydar to convince his wife Meryem that they must go. He sells their livestock and small plot of land in exchange for passage for two. He wants to leave their seven children in the care of the eldest and his parents; his father advises him to take one son to be educated in Europe, as economic insurance. The three set off for Istanbul, Milan, and Switzerland, stowing away on a ship. At Lake Como, they pay the rest of their money to unprincipled men who abandon them at an Alpine pass before a blizzard. Father and son are separated from Meryem. Will anyone reach the land of promise? ↑ "The 63rd Academy Awards (1991) Nominees and Winners". Academy of Motion Picture Arts and Sciences. Retrieved 12 September 2015.